9th of August is Singapore National Day. 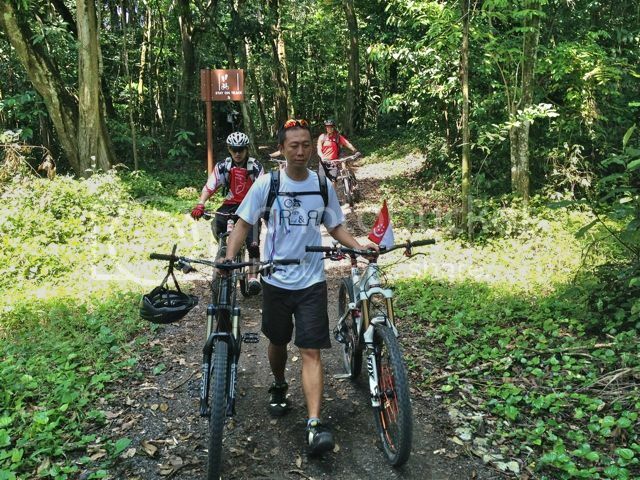 The mountain bike group Rock&Rolla decided to do a mass ride at Bukit Timah bike trail to commemorate Singapore 47th years of nation building. 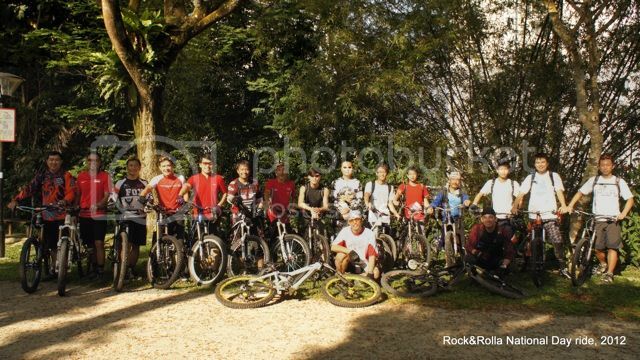 The turn out was awesome, more than 20 riders (some riders were not in the group photo). Hakim was the first to arrive. Although he was fasting, he did one loop at BF before proceed to ZHP to wait for the group. Desmond was the next early bird. In fact, he did two rounds at BT before proceed to ZHP to meet the group. At about 9.00am, Calvin gathered the group together for this amazing group photo shot! As it is a National Day ride, the dressing theme is red. 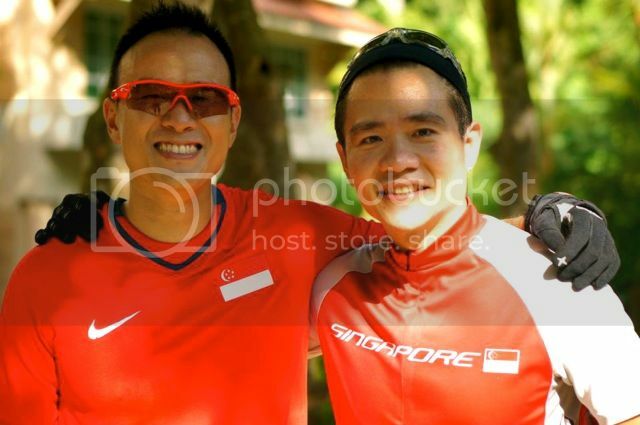 Calvin and myself were wearing Singapore color jersey with Singapore flag logo. In addition, both our bikes also carried Singapore flag at the rear. It was a proud moment and all the riders spirits were high! Keet (left) is one of the Rock&Roller's riders who challenges the wisdom of convention and has proven them wrong. Although he smoke and drink, his stamina is one of the best among the group. He climbed higher and ride further than most riders. The fact that he is a triathlete speaks volume. 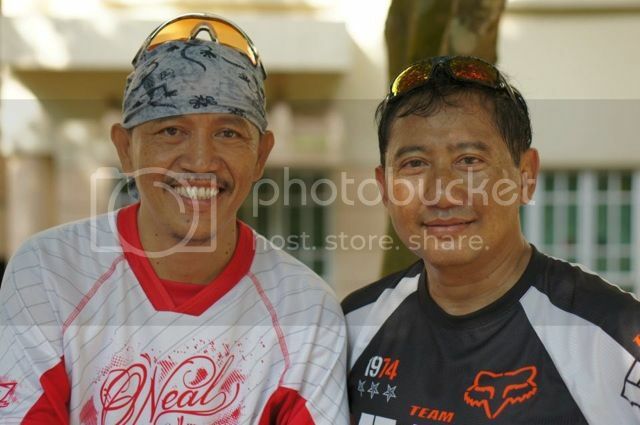 Hakim and Halil were fasting during the National Day ride. 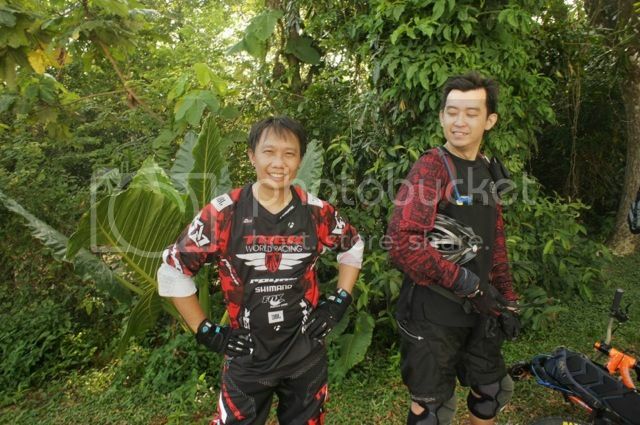 In fact, Hakim completed one loop at BF before joining us for the ride. 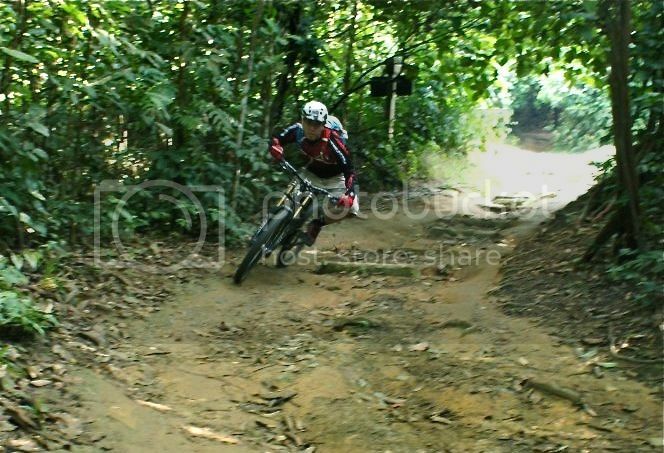 Despite no water and food, Hakim still lead the group with his 29er! Halil climbed his DH bike like a XC. Both men have my utmost respect! It is always fun to have Desmond and Ian in the riding group. Both of them are super fit and skillful. Desmond did two rounds of BT before meeting us at ZHP for National Day ride! Although I have yet to ride with Ian, I have benefited by his advise on tuning the fork and shock. With a strong background in BMX, I was not surprised to see Richard bombed down the slope skillfully and made a perfect switch to exit. This perfect shot was captured by Calvin during the National Day ride. Hongjian demonstrated the right technique to make a turn at high speed. 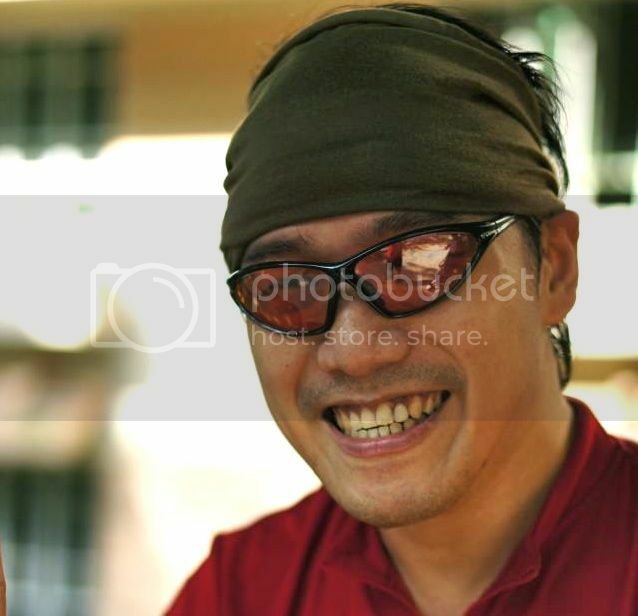 Hongjian is one of the most skillful riders in the R&R group. Other top riders include Chie Hui, Alex and Chee Mum. 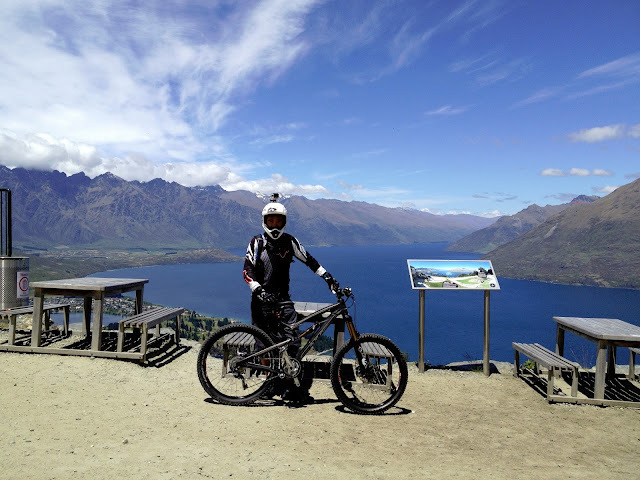 Don't be fooled by their DH bikes, they can climb any terrains in BT trails and put many XC and all-mountain bikers to shame. As the group was too large, we decided to split into 3 groups. One went to T15, another went to BF and third went to BT. As Rick was recovering from arm injury (bone broke into few pieces) from previous fall, Ian decided to join him for T15 ride. It was unfortunate that Rick fell again while attempting to drift down a gravel slope. 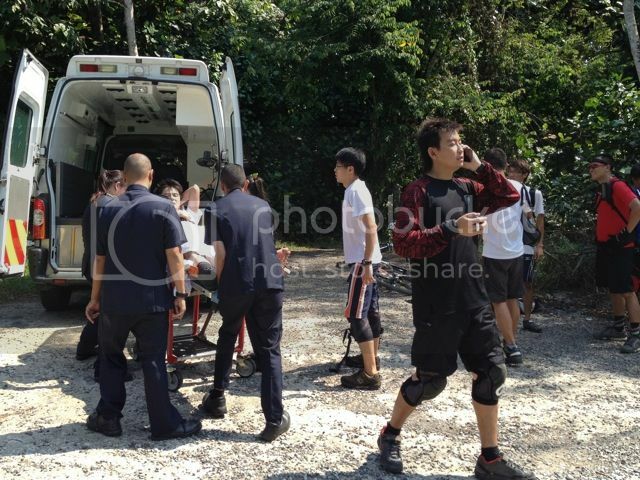 This time round, he suffered spiral fracture on tibia and fibula broken just below knee cap. The accident did dampen some of our spirit, but we all know this is part of the deal in the sport we love. We wish Rick a speedy recovery. Butterfly is ok for riding now? Officially still illegal to ride on BF.